On February 6th, 1765 George Grenville rose in Parliament to offer the fifty-five resolutions of his Stamp Bill. A motion was offered to first read petitions from the Virginia colony and others was denied. The bill was passed on February 17, approved by the Lords on March 8th, and two weeks later ordered in effect by the King. The Stamp Act was Parliament's first serious attempt to assert governmental authority over the colonies. Great Britain was faced with a massive national debt following the Seven Years War. That debt had grown from £72,289,673 in 1755 to £129,586,789 in 1764*. English citizens in Britain were taxed at a rate that created a serious threat of revolt. AN ACT for granting and applying certain stamp duties, and other duties, in the British colonies and plantations in America, towards further defraying the expenses of defending, protecting, and securing the same; and for amending such parts of the several acts of parliament relating to the trade and revenues of the said colonies and plantations, as direct the manner of determining and recovering the penalties and forfeitures therein mentioned. For every skin or piece of vellum or parchment, or sheet or piece of paper, on which shall be engrossed, written, or printed, any declaration, plea, replication, rejoinder, demurrer or other pleading, or any copy thereof; in any court of law within the British colonies and plantations in America, a stamp duty of three pence. For every skin or piece of vellum or parchment, or sheet or piece of paper, on which shall be engrossed, written, or printed, any special bail, and appearance upon such bail in any such court, a stamp duty of two shillings. For every skin or piece of vellum or parchment, or sheet or piece of paper, on which may be engrossed, written, or printed, any petition, bill, answer, claim, plea, replication, rejoinder, demurrer, or other pleading, in any court of chancery or equity within the said colonies and plantations, a stamp duty of one shilling and six pence. For every skin or piece of vellum or parchment, or sheet or piece of paper, on which shall be engrossed, written, or printed, any copy of any position, bill, answer, claim, plea, replication, rejoinder, demurrer, or other pleading in any such court, a stamp duty of three pence. For every skin or piece of vellum or parchment, or sheet or piece of paper, on which shall be engrossed, written, or printed, any monition, libel, answer, allegation, inventory, or renunciation in ecclesiastical matters, in any court of probate court of the ordinary, or other court exercising ecclesiastical jurisdiction within the said colonies and plantations, a stamp duty of one shilling. For every skin or piece of vellum or parchment, or sheet or piece of paper, on which shall be engrossed, written, or printed, any copy of any will (other than the probate thereof) monition, libel, answer, allegation, inventory, or renunciation in ecclesiastical matters, in any such court, a stamp duty of six pence. For every skin or piece of vellum or parchment, or sheet or piece of paper, on which shall be engrossed, written, or printed, any donation, presentation, collation or institution, of or to any benefice, or any writ or instrument for the like purpose, or any register, entry, testimonial, or certificate of any degree taken in any university, academy, college, or seminary of learning within the said colonies and plantations, a stamp duty of two pounds. For every skin or piece of vellum or parchment, or sheet or piece of paper, on which shall be engrossed, written, or printed, any monition, libel, claim, answer, allegation, information, letter of request, execution, renunciation, inventory, or other pleading, in any admiralty court, within the said colonies and plantations, a stamp duty of one shilling. For every skin or piece of vellum or parchment, or sheet or piece of paper, on which shall be engrossed, written, or printed, any appeal, writ of error, writ of dower, ad quod damnum, certiorari, statute merchant, statute staple, attestation, or certificate, by any officer, or exemplification of any record or proceeding, in any court whatsoever, within the said colonies and plantations (except appeals, writs of error, certiorari attestations, certificates, and exemplifications, for, or relating to the removal of any proceedings from before a single justice of the peace), a stamp duty of ten shillings. For every skin or piece of vellum or parchment, or sheet or piece of paper, on which shall be engrossed, written, or printed, any writ of covenant for levying fines, writ of entry for suffering a common recovery, or attachment issuing out of, or returnable into, any court within the said colonies and plantations, a stamp duty of five shillings. For every skin or piece of vellum or parchment, or sheet or piece of paper, on which shall be engrossed, written, or printed, any judgment, decree, sentence, or dismission or any record of nisi prius or postea, in any court within the said colonies and plantations, a stamp duty of four shillings. For every skin or piece of vellum or parchment, or sheet or piece of paper, on which shall be engrossed, written, or printed, any affidavit, common bail, or appearance, interrogatory, deposition, rule, order or warrant of any court, or any dedimus potestatem, capias subpoena, summons, compulsory citation, commission, recognizance, or any other writ, process, or mandate, issuing out of, or returnable into, any court, or any office belonging thereto, or any other proceeding therein whatsoever, or any copy thereof, or of any record not herein before charged, within the said colonies and plantations (except warrants relating to criminal matters, and proceedings thereon, or relating thereto), a stamp duty of one shilling. For every skin or piece of vellum or parchment, or sheet or piece of paper, on which shall be engrossed, written, or printed, any note or bill of lading, which shall be signed for any kind of goods, wares, or merchandise, to be exported from, or any cocket or clearance granted within the said colonies and plantations, a stamp duty of four pence. For every skin or piece of vellum or parchment, or sheet or piece of paper, on which shall be engrossed, written, or printed, letters of mart or commission for private ships of war, within the said colonies and plantations, a stamp duty of twenty shillings. For every skin or piece of vellum or parchment, or sheet or piece of paper, on which shall be engrossed, written, or printed, any grant, appointment, or admission of, or to, any public beneficial office or employment, for the space of one year, or any lesser time, of or above twenty pounds per annum sterling money, in salary, fees, and perquisites, within the said colonies and plantations (except commissions and appointments of officers of the army, navy, ordnance, or militia, of judges, and of justices of the peace), a stamp duty of ten shillings. For every skin or piece of vellum or parchment, or sheet or piece of paper, on which any grant, of any liberty, privilege, or franchise, under the seal or sign manual of any governor, proprietor, or public officer, alone, or in conjunction with any other person or persons, or with any council, or any council and assembly, or any exemplification of the same, shall be engrossed, written, or printed, within the said colonies and plantations, a stamp duty of six pounds. For every skin or piece of vellum or parchment, or sheet or piece of paper, on which shall be engrossed, written, or printed, any license for retailing of spirituous liquors, to be granted to any person who shall take out the same, within the said colonies and plantations, a stamp duty of twenty shillings. For every skin or piece of vellum or parchment, or sheet or piece of paper, on which shall be engrossed, written, or printed, any license for retailing of wine, to be granted to any person who shall not take out a license for retailing of spirituous liquors, within the said colonies and plantations, a stamp duty of four pounds. For every skin or piece of vellum or parchment, or sheet or piece of paper, on which shall be engrossed, written, or printed, any license for retailing of wine, to be granted to any person who shall take out a license for retailing of spirituous liquors, within the said colonies and plantations, a stamp duty of three pounds. For every skin or piece of vellum or parchment, or sheet or piece of paper, on which shall be engrossed, written, or printed, any probate of will, letters of administration, or of guardianship for any estate above the value of twenty pounds sterling money, within the British colonies and plantations upon the continent of America, the islands belonging thereto and the Bermuda and Bahama islands, a stamp duty of five shillings. For every skin or piece of vellum or parchment, or sheet or piece of paper, on which shall be engrossed, written, or printed, any such probate, letters of administration or of guardianship, within all other parts of the British dominions in America, a stamp duty of ten shillings. For every skin or piece of vellum or parchment, or sheet or piece of paper, on which shall be engrossed, written, or printed, any bond for securing the payment of any sum of money, not exceeding the sum of ten pounds sterling money within the British colonies and plantations upon the continent of America, the islands belonging thereto, and the Bermuda and Bahama islands, a stamp duty of six pence. For every skin or piece of vellum or parchment, or sheet or piece of paper, on which shall be engrossed, written, or printed, any bond for securing the payment of any sum of money above ten pounds, and not exceeding twenty pounds sterling money, within such colonies, plantations, and islands a stamp duty of one shilling. For every skin or piece of vellum or parchment, or sheet or piece of paper, on which shall be engrossed, written, or printed, any bond for securing the payment of any sum of money above twenty pounds, arid not exceeding forty pounds sterling money, within such colonies, plantations, and islands, a stamp duty of one shilling and six pence. For every skin or piece of vellum or parchment, or sheet or piece of paper, on which shall be engrossed, written, or printed, any order or warrant for surveying or setting out any quantity of land, not exceeding one hundred acres, issued by any governor, proprietor, or any public officer, alone, or in conjunction with any other person or persons, or with any council, or any council and assembly, within the British colonies and plantations in America, a stamp duty of six pence. For every skin or piece of vellum or parchment, or sheet or piece of paper, on which shall be engrossed, written, or printed, any such order or warrant for surveying or setting out any quantity of land above one hundred and not exceeding two hundred acres, within the said colonies and plantations, a stamp duty of one shilling. For every skin or piece of vellum or parchment, or sheet or piece of paper, on which shall be engrossed, written, or printed, any such order or warrant for surveying or setting out any quantity of land above two hundred, and not exceeding three hundred and twenty acres, and in proportion for every such order or warrant for surveying or setting out every other three hundred and twenty acres, within the said colonies and plantations, a stamp duty of one shilling and six pence. For every skin or piece of vellum or parchment, or sheet or piece of paper, on which shall be engrossed, written, or printed, any original grant, or any deed, mesne conveyance, or other instrument whatsoever, by which any quantity of land, not exceeding one hundred acres, shall be granted, conveyed, or assigned, within the British colonies and plantations upon the continent of America, the islands belonging thereto, and the Bermuda and Bahama islands (except leases for any term not exceeding the term of twenty one years), a stamp duty of one shilling and six pence. For every skin or piece of vellum or parchment, or sheet or piece of paper, on which shall be engrossed, written, or printed, any such original grant, or any such deed, mesne conveyance, or other instrument whatsoever, by which any quantify of land above one hundred, and not exceeding two hundred acres, shall be granted, conveyed, or assigned, within such colonies, plantations, and islands, a stamp duty of two shillings. For every skin or piece of vellum or parchment, or sheet or piece of paper, on which shall be engrossed, written, or printed, any such original grant, or any such deed, mesne conveyance, or other instrument whatsoever, by which any quantity of land above two hundred, and not exceeding three hundred and twenty acres, shall be granted, conveyed, or assigned, and in proportion for every such grant, deed, mesne conveyance, or other instrument, granting, conveying, or assigning, every other three hundred and twenty acres, within such colonies, plantations, and islands, a stamp duty of two shillings and six pence. For every skin or piece of vellum or parchment, or sheet or piece of paper, on which shall be engrossed, written, or printed, any such original grant, or any such deed, mesne conveyance, or other instrument whatsoever, by which any quantity of land, not exceeding one hundred acres, stall be granted, conveyed, or assigned, within all other parts of the British dominions in America, a stamp duty of three shillings. For every skin or piece of vellum or parchment, or sheet or piece of paper, on which shall be engrossed, written, or printed, any such original grant, or any such deed, mesne conveyance, or other instrument whatsoever, by which any quantity of land above one hundred, and not exceeding two hundred acres, shall be granted, conveyed, or assigned, within the same parts of the said dominions, a stamp duty of four shillings. For every skin or piece of vellum or parchment, or sheet or piece of paper, on which shall be engrossed, written, or printed, any such original grant, or any such deed, mesne conveyance, or other instrument whatsoever, by which any quantity of land above two hundred, and not exceeding three hundred twenty acres, shall he granted, conveyed, or assigned, and in proportion for every such grant, deed, mesne conveyance, or other instrument, granting, conveying, or assigning every other three hundred and twenty acres, within the same parts of the said dominions, a stamp duty of five shillings. For every skin or piece of vellum or parchment, or sheet or piece of paper, on which shall be engrossed, written, or printed, any grant, appointment, or admission, of or to any beneficial office or employment, not herein before charged, above the value of twenty pounds per annum sterling money in salary, fees, and perquisites, or any exemplification of the same, within the British colonies and plantations upon the continent of America, the islands belonging thereto, and the Bermuda and Bahama islands (except commissions of officers of the army, navy, ordnance, or militia, and of justices of the pence), a stamp duty of four pounds. For every skin or piece of vellum or parchment, or sheet or piece of paper, on which shall be engrossed, written, or printed, any such grant, appointment, or admission, of or to any such public beneficial office or employments or any exemplification of the same, within all other parts of the British dominions in America, a stamp duty of six pounds. For every skin or piece of vellum or parchment, or sheet or piece of paper, on which shall be engrossed, written, or printed, any indenture, lease, conveyance, contract, stipulation, bill of sale, charter party, protest, articles of apprenticeship or covenant (except for the hire of servants not apprentices, and also except such other matters as herein before charged) within the British colonies and plantations in America, a stamp duty of two shillings and six pence. For every skin or piece of vellum or parchment, or sheet or piece of paper, on which any warrant or order for auditing any public accounts, beneficial warrant, order grant, or certificate, under any public seal, or under the send or sign manual of any governor, proprietor, or public officer, alone, or in conjunction with any person or persons, or with any council, or any council and assembly, not herein before charged, or any passport or let pass, surrender of office, or policy of assurance, shall be engrossed, written, or printed, within the said colonies and plantations (except warrants or orders for the service of the army, navy, ordnance, or militia, and grants of offices under twenty pounds per annum, in salary, fees, and perquisites), a stamp duty of five shillings. For every skin or piece of vellum or parchment, or sheet or piece of paper, on which shall be engrossed, written or printed, any notarial net, bond, deed, letter of attorney, procuration, mortgage, release, or other obligatory instrument, not herein before charged, within the said colonies and plantations, a stamp duty of two shillings and three pence. 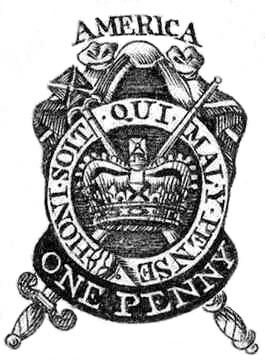 For every skin or piece of vellum or parchment, or sheet or piece of paper, on which shall be engrossed, written, or printed, any register, entry, or enrollment of any grant, deed or other instrument whatsoever, herein before charged, within the said colonies and plantations, a stamp duty of three pence. For every skin or piece of vellum or parchment, or sheet or piece of paper, on which shall be engrossed, written, or printed, any register, entry, or enrollment of any grant, deed, or other instrument whatsoever, not herein before charged, within the said colonies and plantations, a stamp duty of two shillings. For every pack of such cards, one shilling. And for every pair of such dice, ten shillings. For every such pamphlet and paper contained in a half sheet, or any lesser piece of paper, which shall be so printed, a stamp duty of one half penny for every printed copy thereof. For every such pamphlet and paper (being larger than half a sheet, and not exceeding one whole sheet), which shall be printed, a stamp duty of one penny for every printed copy thereof. For every pamphlet and paper, being larger than one whole sheet, and not exceeding six sheets in octavo, or in a lesser page, or not exceeding twelve sheets in quarto, or twenty sheets in folio, which shall be so printed, a duty after the rate of one shilling for every sheet of any kind of paper which shall be contained in one printed copy thereof. For every advertisement to be contained in any gazette newspaper, or other paper, or any pamphlet which shall be so printed, a duty of two shillings. For every almanac, or calendar, for any one particular year, or for any time less than a year, which shall be written or printed on one side only of any one sheet, skin, or piece of paper, parchment, or vellum, within the said colonies and plantations, a stamp duty of two pence. For every other almanac or calendar, for any one particular year, which shall be written or printed within the said colonies and plantations, a stamp duty of four pence. And for every almanac or calendar, written or printed in the said colonies and plantations, to serve for several years, duties to the same amount respectively shall be paid for every such year. And there shall be also paid, in the said colonies and plantations, a duty of six pence for every twenty shillings, in any sum not exceeding fifty pounds sterling money, which shall be given, paid, contracted, or agreed for, with, or in relation to, any clerk or apprentice, which shall be put or placed to or with any master or mistress, to learn any profession, trade, or employment.